Inspired by the plasma industry, Sartoclear Dynamics® is based on the principles of body feed filtration. As a result, it replaces centrifuges and the subsequent depth filters in a single step. Sartoclear Dynamics® Lab has been designed for simultaneous clarification and sterile filtration of small volumes of mammalian cell cultures produced in R&D labs. It saves valuable time and helps recover intact protein quickly and reproducibly for the next process step. Sartoclear Dynamics® process solutions for ready-to-use clarification enable single-use processing of up to 2,000 liters mammalian cell culture. Consistent results, ease of use, enormous speed and flexible scalability are the key characteristics of this technology. In the past decade, the productivity of fed-batch mammalian cell cultures has risen significantly. Driven by optimized strains and culture media, biomass concentrations have increased from 1 – 3 g/l to 7 – 10 g/L. High biomass concentrations challenge depth filters so that capacities have become very limited. Above 500 L a centrifuge seemed to be inevitable in order to reduce costs and waste. 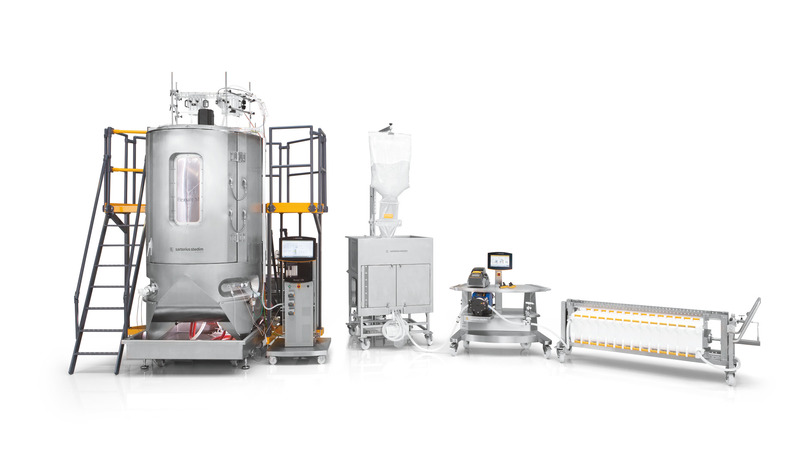 With 2,000 L single-use bioreactors available a breakthrough technology was needed to enable a fully single-use process. Sartoclear Dynamics® is a complete ready-to-use technology designed to harvest your bioreactor. Based on the principles of body feed filtration, it is ideal for high cell density cultures of up to 2,000 liters. Our solution: The addition of a highly porous filter-aid to the feed stream. This increases the permeability of the filter cake and prevents the filter from getting blocked. Single-use: Save on an upfront investment in a centrifuge and its high maintenance costs. The single-use process of Sartoclear Dynamics® is fast, clean, reliable, economical and flexible. Scalability: Do not worry about changing the volume of your bioreactor. You can adapt the amount of DE and the number of Sartoclear Dynamics® filtration units to whatever volume and size you may need. With Sartoclear Dynamics® Scale you can easily determine the optimal ratio of DE to your biomass and linearly scale this to your process application. Speed: The installation is quick and easy and preparation short since you do not have to preflush the filters. Sartoclear Dynamics® works with high flow rates and saves you the secondary step of depth filtration. Consistency: Thanks to a constant ratio of diatomaceous earth (DE) to your biomass, the performance of Sartoclear Dynamics® is predictable. Variable parameters such as cell viability and cell size do not impact your results. Sartoclear Dynamics® Lab products have been designed for harvesting 15 mL to 1 L volumes of cell cultures in the labs. It performs the clarification and sterile filtration at a glance, fast, effortless, without any prior centrifugation step. The kits combine the use of a filter aid for clarification and a 0.2 µm filter for sterile filtration. Sartoclear Dynamics® Scale is designed for determining the optimal process conditions for body feed based harvesting processes. The excellent scalability characteristics of the small scale device allows linear scaling with the process scale Sartoclear Dynamics® Filters. With Sartoclear Dynamics®, the DE is directly mixed into the cell culture fluid. The innovative powder transfer system ensures a fast and dust-free transfer of the DE. The powder transfer adapter is mounted on the seal. The Sartoclear Dynamics® DE Powder Bag and the adapter are connected with a functional zipper. Clamps keep the plastic film in position and protect the rails during powder transfer. Get an overview of all Sartoclear Dynamics® system components, consumables and accessories.